Female condom maker Female Health (NASDAQ:VERU) announced today its fourth-quarter dividend of $0.07 per share, the same rate it's paid for the past two quarters after raising the payout 17% from $0.06 per share. The board of directors said the quarterly dividend is payable on Nov. 6 to the holders of record at the close of business on Oct. 30. 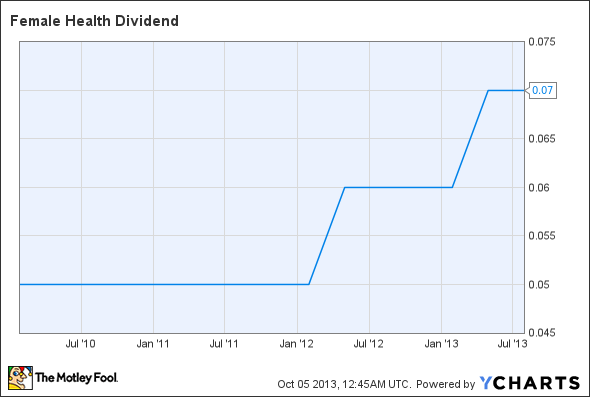 The payout represents the birth-control-device maker's 16th consecutive quarterly dividend. Stating the company's belief the payment of dividends allows shareholders to participate in the success of the company, Female Health Chairman and CEO O.B. Parrish said, "The Company's profitability has generated cash from operations that exceeds the Company's capital spending requirements, and the Company remains debt-free. We believe that utilizing some of this excess cash flow to pay cash dividends is in the best interests of our shareholders." The regular dividend payment equates to a $0.28-per-share annual dividend, yielding 2.8% based on the closing price today of Thor Industries' stock.